511 Tactical ATAC Storm 8" Side Zip Waterproof Boot (12004) FREE SHIPPING! The 5.11 A.T.A.C. boots were designed by and for law enforcement professionals for the most comfortable shift possible. Leather construction ensures a sharp appearance with a shiny polishable toe, 5.11's Shock Mitigation System® technology for support, and an oil/slip resistant outsole for stability. And don't forget to check out all of the 511 Tactical clothing and gear that we carry. Love these boots. Bought them for the incoming snow season in Colorado. Comfortable and lightweight. 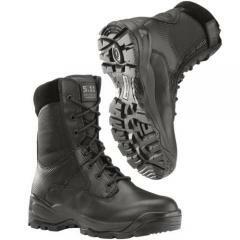 ©2002-2019 CopsPlus.com: 511 Tactical ATAC Storm 8" Side Zip Waterproof Boot (12004) FREE SHIPPING!